Big Bow Field was discovered in 1989 and has produced more than 6.6 million barrels oil. Sand Arroyo Creek Field was discovered in 1996 and has produced over 0.1 million barrels oil. Sand Arroyo Creek Southwest Field was discovered in 1996 and has produced over 0.4 million barrels oil. A total of 750 feet of cored section of the St. Louis Limestone from 10 wells around Big Bow and Sand Arroyo Creek fields was described in terms of Dunham classification, 1962 (figure 1; table 1). Core interpretations include lithofacies type, depositional fabric, fracture, grain size, the type of porosity, color, bedding, fossil content, and interpreted water depth. Six major lithofacies were recognized and classified on a half-foot interval. The six major lithofacies and interpreted depositional environment recognized in core follow previous work (Dunham, 1962; Handford, 1998, 1991; Carr and Lundgren, 1994; Abegg, 1991, 1994, 2001a, 2001b). They are: 1) quartz-rich carbonate grainstone interpreted as eolianite complexes, including eolianite dunes, interdunes, wadis, and possible minor marine occurrence; 2) argillaceous limestone deposited in deep marine environment; 3) skeletal wackestone deposited in open marine environment; 4) skeletal grainstone/packstone deposited in a restricted lagoon or tidal flat; 5) porous ooid grainstone indicating deposition of shallow-marine shoals on an open shelf; and 6) cemented ooid grainstone deposited in a similar environment as ooid grainstone, but with reduced porosity and permeability due to cementation. By clicking the cored wells on table 1, detailed information of each well (core photos, core description table, etc.) can be displayed. This report is part of a larger study of the St. Louis Limestone in southwest Kansas that includes interpretive cross sections (Qi and Carr, 2005), geostatistical lithofacies predictions (Qi and Carr, in press), and geostatistical facies modeling (Qi, Carr, and Goldstein, in prep.). Figure 1--Well location map of Big Bow West, Sand Arroyo Creek, and Sand Arroyo Creek Southwest fields, T29-T30S and R38-R41W, St. Louis Limestone, southwest Kansas. Ten cored wells are displayed as well as status of all wells. This figure is available as a larger PDF version (128 KB). Table 1--List of available cored wells of St. Louis Limestone that were described in detail. Click on well name to display detailed core decription. 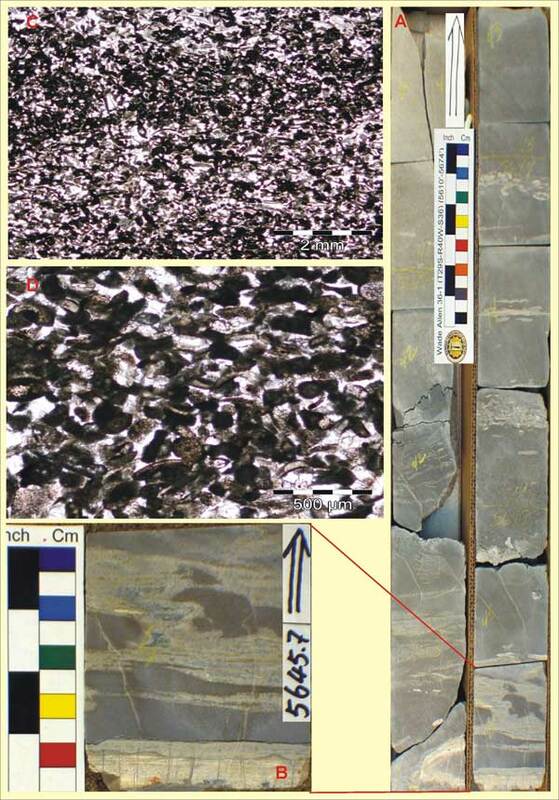 The quartz-rich carbonate grainstone lithofacies (lithofacies 1) consists of well-sorted ooid, skeletal, peloidal carbonate grains mixed with very-fine siliciclastic sand and silt (Figure 2). This facies contains silts, very-fine to medium quartz grains and fine to medium-grained peloids, skeletal fragments, and ooids. Cement is micrite and calcite spar. According to visual estimation, quartz grains compose up to 50 percent of the rock volume. Cross bedding is recognized in core. Angles of cross bedding range up to 25°, but most commonly are in the 10°-20° range. Translatent stratification and stylolites are common features (Figure 2B). 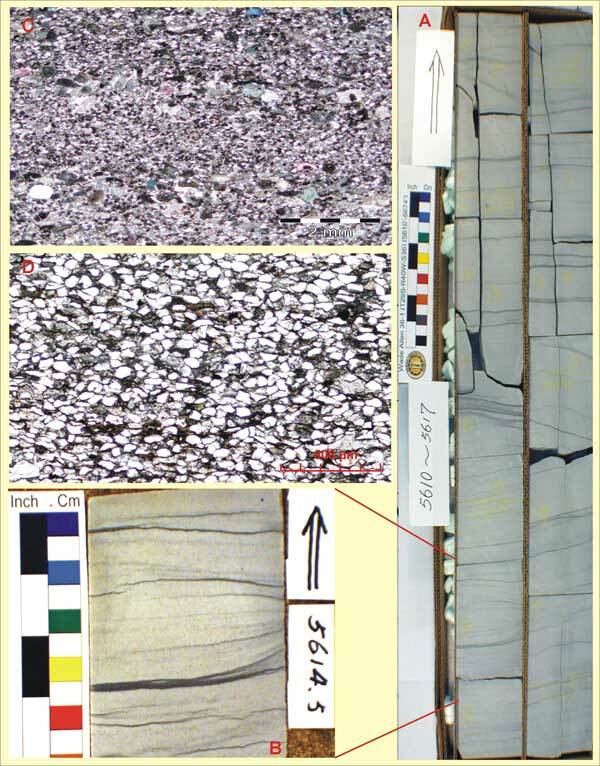 Acid etchings of core samples and photomicrographs commonly show a greater concentration of finer quartz grains at the base of each lamination with concentration of coarser carbonate grains increasing to the top of each lamination (Figure 2C). Compactional effects, broken ooids, oriented grains, calcite-filled fractures, and minor dissolution of grains were observed in core. Root structures were also observed, but are not common. The quartz-rich carbonate grainstone lithofacies ranges in thickness from two feet (0.5 meter) to over 50 feet (15 m), and at an individual location can compose up to 70 percent of the stratigraphic thickness of the St. Louis Limestone. Figure 2--Quartz-rich carbonate grainstone (lithofacies 1), St. Louis Limestone, Wade Allen 36-1. A) Core photo of a quartz-rich carbonate grainstone section with abundant inverse translatent stratification dipping at varying directions and angles up to 10°, 5612-5616 ft core depth. B) Close-up core photo of stylolites and inverse translatent stratification (showing horsetail structure), 5614.5 ft core depth. C) Thin-section photomicrograph of quartz-rich carbonate grainstone, 5613.8 ft core depth. D) Photomicrograph show translatent stratification with fine-grained quartz at the base and coarser carbonate grains at the top. A larger version of this figure is available. An increased quartz fraction and low gamma-ray values are typical features for this lithofacies. Crossover of neutron-density logs indicates an increase in detrital quartz and can be used to evaluate lateral continuity (e.g. Figure 10). However, subtidal St. Louis Limestone lithofacies can also contain quartz grains and produce similar log signatures. The quartz-rich carbonate grainstone lithofacies is typically underlain by argillaceous limestone or oolitic grainstone and overlain by ooid grainstone or skeletal wackestone. The contacts of this lithofacies with underlying lithofacies and overlying lithofacies are sharp with grain size and color change. Based on a variety of evidence including presence of translatent stratification, root structures, high concentration of quartz grains, and general absence of open-marine fauna, the quartz-rich carbonate grainstone is interpreted as deposited in the eolian dune environment. Stylolitization is common. The quartz-rich carbonate grainstone lithofacies is well cemented and permeability is less than 1md, and most commonly less than 0.01md, and considered a non-reservoir flow unit. The argillaceous limestone lithofacies (lithofacies 2) is a thin, laterally extensive unit, characterized by thin bedded, often fissile, olive-green to gray argillaceous limestone, which is primarily wackestone or packstone with abundant bryozoans, crinoids, minor brachiopods, and ostracods (figure 3). Fossil fragments are well preserved, and whole fossils are common. Thickness of this lithofacies is from one foot (0.3 m) to 10 feet (3 m). 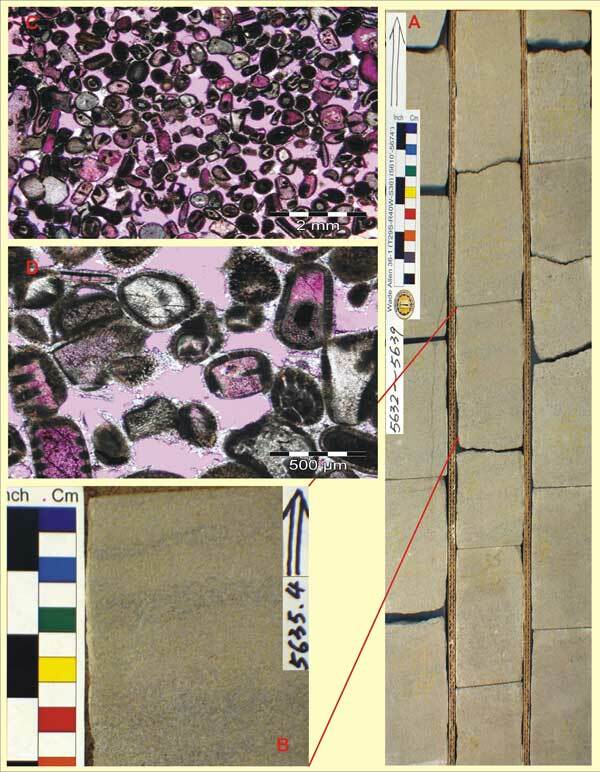 Figure 3--Argillaceous limestone (lithofacies 2), St. Louis Limestone, Wade Allen 36-1. A) Core photo of thinly bedded argillaceous limestone section, 5624-5629 ft core depth. B) Close-up core photo of the muddy limestone with abundant bryozoans, crinoids, brachiopods, and ostracods, 5626.3 ft core depth. 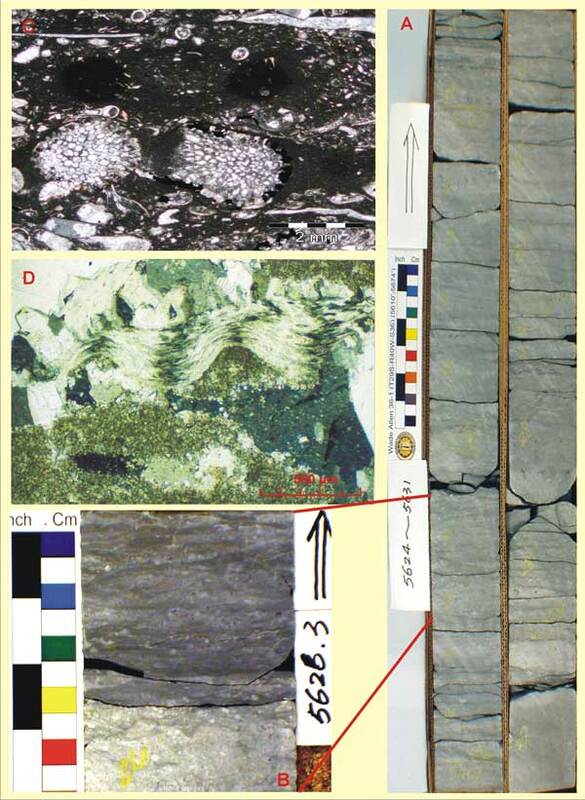 C and D) Thin-section photomicrographs of argillaceous limestone, micritic muds at the lower part, well-preserved brachiopod and large spar calcite at the upper part, 5626.3 ft core depth. A larger version of this figure is available. Occasionally, the argillaceous limestone lithofacies contains small amounts of very fine to medium detrital quartz. This lithofacies can be easily recognized in core by its fissile bedding and green-gray color. On electric logs, the lithofacies shows a distinctively higher gamma-ray response relative to adjacent lithofacies. The argillaceous limestone lithofacies is usually underlain by skeletal wackestone or ooid grainstone and overlain by quartz-rich carbonate grainstone. The contact of this lithofacies with overlying lithofacies is very sharp with a significant color and size change. The contact with the underlying lithofacies is gradational but well-defined by grain size and color change. The argillaceous limestone lithofacies is a laterally extensive feature, and is interpreted as representing a major deepening event. The abundant bryozoans and crinoids in wackestones and packstones, especially well-preserved whole fossils, indicate the argillaceous limestone lithofacies was deposited in a relatively deep marine environment. The argillaceous limestone lithofacies has very low porosity and permeability, and is considered a non-reservoir flow unit. The skeletal wackestone lithofacies (lithofacies 3) is mud-supported and very poorly sorted (Figure 4). Primary sedimentary structures have been completely obliterated by bioturbation. The lithofacies is greenish to dark yellowish-brown in color with large, relatively un-abraided skeletal fragments (Figure 4C, D). Crinoids and fenestrate bryozoans are the most abundant skeletal fragments. Also present are echinoderms, brachiopods, gastropods, and foraminifera. Some skeletal fragments were micritized and have superficial oolitic coatings. Large skeletal fragments float in the micritic matrix. Some solution-seam stylolites are present in this lithofacies. Thickness range for the skeletal wackestone lithofacies is from one-half foot (15-30 cm) to 7 feet (2.1 m). Figure 4--Skeletal wackestone (lithofacies 3), St. Louis Limestone, Wade Allen 36-1. A) Core photo of skeletal wackestone section, 5629-5630 ft core depth. B) Close up core photo of wackestone with abundant skeletal fragments and absence of primary sedimentary structures, 5629.5 ft core depth. C and D) Thin section photomicrographs of skeletal wackestone, relatively un-abraided skeletal fragments (crinoids, fenestrate bryozoans, echinoderms, brachiopods, gastropods and foraminifera) float in micritic matrix, 5629.35 ft core depth. A larger version of this figure is available. The skeletal wackestone lithofacies has a slightly increased gamma-ray response, however on log response alone it cannot be easily distinguished from the skeletal grainstone/packstone limestone or the quartz-rich carbonate grainstone lithofacies. The ooid grainstone or skeletal grainstone/packstone limestone lithofacies typically underlie the skeletal wackestone lithofacies with a gradual contact characterized by grain-size and color (yellowish-brown to light gray). The skeletal wackestone lithofacies is overlain with a gradual contact by the argillaceous limestone lithofacies. Poor sorting, large skeletal fragments, limited siliciclastic influx, and a micritic matrix suggest that this lithofacies was deposited in a low energy, open-marine shelf environment. Porosity averages less than one percent, with permeability of less than 0.01 md, and the skeletal wackestone lithofacies is considered a non-reservoir flow unit. The skeletal grainstone/packstone lithofacies (lithofacies 4) is composed of very fine skeletal grains with many peloidal grains and some very-fine quartz and fine ooid grains (figure 5). This lithofacies is greenish to dark yellowish-brown color, and contains variable amounts of relatively unabraded skeletal fragments. Crinoid and fenestrate bryozoan are abundant with echinoderms, brachiopod, gastropod, and foraminifera also present. 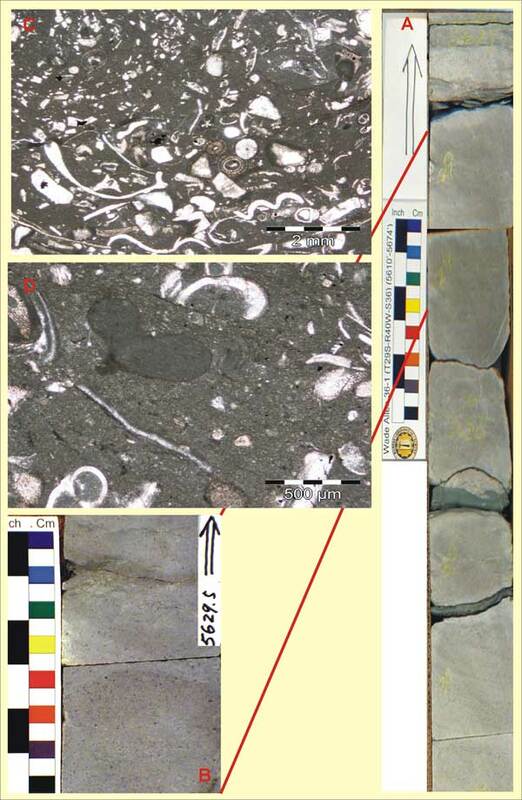 Bioturbation, algae lamination, mud intraclast, stromatolites, chert replacement, and fenestrae are common characteristic structures of the skeletal grainstone/packstone lithofacies, and indicate deposition in an intertidal to supratidal environment. Large vugs, filled with anhydrite or replaced with chert or calcite spar, and algal laminations along with common solution-seam stylolites were observed (Figure 5B). Rare meniscus and pendant cements were observed. Observed thickness range of skeletal grainstone/packstone lithofacies is from one-half foot (15-30 cm) to 5 feet (1.5 m). Figure 5--Skeletal grainstone/packstone limestone (lithofacies 4), St. Louis Limestone, Wade Allen 36-1. A) Core photo of skeletal grainstone/packstone section, 5641-5646 ft core depth. B) Close up core photo of skeletal grainstone/packstone, algae laminations replaced with chert or calcite spar, 5645.7 ft core depth. C and D) Thin section photomicrographs, peloidal grains cemented by calcite spar, 5646.25 ft core depth. A larger version of this figure is available. Generally, gamma-ray log response is less than skeletal wackestone and greater than ooid grainstone lithofacies (below), and porosity log response is low. The skeletal grainstone/packstone lithofacies is difficult to distinguish on logs from the skeletal wackestone lithofacies. Typically, the skeletal grainstone/packstone lithofacies occurs adjacent to the ooid-skeletal grainstone lithofacies. Occasionally, in wells where no ooid grainstone shoals were observed, it is an interval above the eolianite lithofacies and below the transgressive argillaceous limestone lithofacies. Typically, the contacts with overlying and underlying lithofacies are gradual. On some occasions, a sharp surface was observed, which may be the expression of a subaerial exposure surface. The fenestral limestone is interpreted as tidal flat deposit, and the skeletal grainstone/packstone is interpreted as back barrier lagoonal deposit. Since these two lithofacies could not be distinguished with digital well logs, and both are considered non-reservoir flow units, they were combined for the convenience of modeling. Porosity averages usually less than one percent, with permeability of less than 0.01 md, and the skeletal grainstone lithofacies is considered a non-reservoir flow unit. The porous ooid grainstone lithofacies (lithofacies 5) is characterized by medium to very-coarse moderately-sorted ooids, and absence of mud (figure 6). The ooids have a radial concentric structure with skeletal grains, peloids, and occasionally detrital quartz nuclei, and are usually unbroken. Large skeletal grains and peloids are present. The common skeletal fragments are echinoderms, bryozoan, and brachiopods. Compactional fabrics, pressure-dissolution, broken grains, and fracturing were observed in some intervals. Stylolitization is common. Cross stratification is characterized by subtle cross bedding, defined by thin intervals composed of elongate skeletal particles displaying a degree of cementation. Observed thickness range of porous ooid grainstone lithofacies is from 1.5 foot (45 cm) to 15 feet (4.5 m). Figure 6--Porous ooid grainstone (lithofacies 5), St. Louis Limestone, Wade Allen 36-1. A) Core photo of brownish ooid grainstone section, 5632-5637 ft core depth. B) Close up core photo of ooid grainstone, subtle cross stratification defined by thin interval composed of elongate skeletal particles with varying cementation, 5635.4 ft core depth. C and D) Thin section photomicrograph, radial concentric ooid grains with cemented by meniscus, rim calcite and usually unbroken, primary interpartical porosity preserved up to 20 percent, 5633.6 ft core depth. Polarized light with the 1st order red plate inserted. Little pressure solution observed. A larger version of this figure is available. The porous ooid grainstone lithofacies has a distinctive log response with higher porosity and lower resistivity relative to adjacent beds. Gamma-ray response generally is low, indicating the absence of both fine grained organic material and clays. The porous ooid grainstone lithofacies is usually bounded top and bottom by skeletal wackestone or quartz-rich carbonate grainstone lithofacies. Thin interbeds of fenestral limestone or skeletal grainstone/packstone lithofacies were observed. The contacts with overlying lithofacies and underlying lithofacies are gradual, and defined by changes in color. Where the ooid grainstone lithofacies is overlain by quartz-rich carbonate grainstone lithofacies, the contact is defined by a possible subaerial exposure surface. Ooid micritization and dissolution were observed and some intraparticle microporosity was developed. However, in the porous ooid grainstone lithofacies, the main porosity is interparticle porosity with minor moldic porosity. Primary interparticle pores were filled with varying degrees of meniscus, rim, syntaxial and coarsely crystalline "spar" calcite cement (Figure 6D). Lower porosity grainstone typically contains more abundant skeletal debris. The presence of ooids, superficial ooids, and the absence of mud indicates that ooid grainstone lithofacies accumulated in a high-energy, open-marine mobile grain shoal environment. Total porosity varies from 3 percent to as high as 20 percent and permeability ranges from 0.1 md to 2000 md, and is considered a reservoir-quality flow unit. The cemented ooid grainstone lithofacies (lithofacies 6) is composed of medium to very coarse moderately sorted ooids (Figure 7). The ooids have a radial concentric structure and are usually unbroken. Large skeletal grains and peloids are present. Pressure solution, compaction and late cementation occlude interparticle voids. Total porosity varies from 1 percent to 3 percent and permeability is usually less than 0.1 md. This lithofacies is considered a non-reservoir quality flow unit. Observed thickness range of cemented ooid grainstone lithofacies is from 0.7 foot (20 cm) to 5.5 feet (1.6 m). Figure 7--Cemented ooid grainstone (lithofacies 6), St. Louis Limestone, Wade Allen 36-1. A) Core photo of cemented ooid grainstone section, 5647-5648.5, 5664-5665 ft core depth. B) Close up core photo of cemented ooid grainstone, subtle cross bedding and stylolite structure showed, 5648 ft core depth. 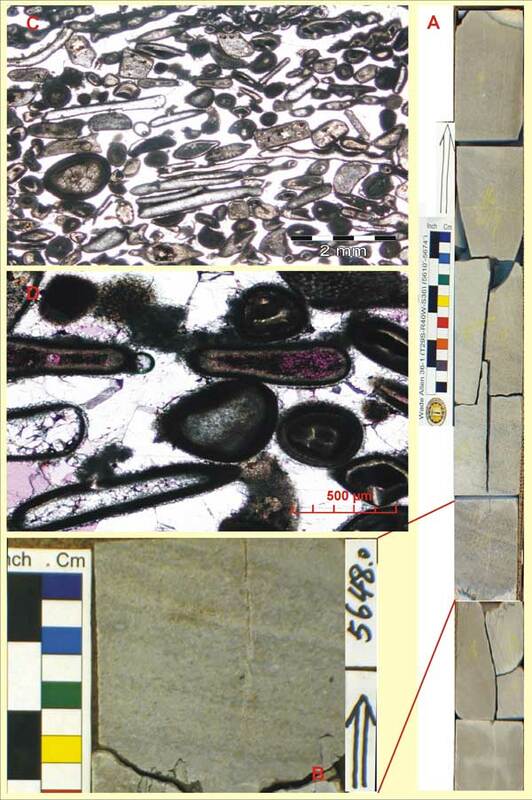 C and D) Thin section photomicrographs, radial concentric ooid grains and skeletal fragments cemented by syntaxial calcite cement, usually more than 50 percent of the pore system, 5631 ft core depth. Polarized light with the 1st order red plate inserted. Fewer meniscuses cement and some pressure solution observed. A larger version of this figure is available. The porous ooid grainstone and cemented ooid grainstone lithofacies were both deposited as mobile grain shoals. However, cemented ooid grainstone has been separated as another lithofacies or flow unit from porous ooid grainstone. Because of the reduced porosity and permeability due to cementation, the cemented ooid grainstone lithofacies has different rock and fluid property response from non-cemented ooid grainstone lithofacies. The distinction of these two lithofacies as separate flow units provides fluid barriers that could be modeled as stochastic objects. Abegg, F.E., 1991, Sedimentology and lithostratigraphy of the Upper Mississippian Ste. Genevieve and St. Louis limestones, southwestern Kansas. Integrated studies of petroleum reservoirs in the mid-continent: American Assoc. of Petroleum Geologists, Midcontinent Section Meeting. p. 1-33. Abegg, F.E., 1994, Lithostratigraphy of the Hugoton and Stevens members of the St. Louis Limestone and the Ste. Genevieve Limestone (Upper Mississippian), southwestern Kansas, in, Baars, D.L., (compl. ), Revision of stratigraphic nomenclature in Kansas: Kansas Geological Survey Bulletin, No. 230, p. 39-66. Abegg, F.E., Loope, D.B., and Harris, P.M., 2001a, Deposition and diagenesis of carbonate eolianites, in Abegg, F. E., P. M. Harris, and D. B. Loope, eds., Modern and ancient carbonate eolianites: sedimentology, sequence stratigraphy, and diagenesis: Society of Sedimentary Geology SEPM Special Publication No. 71, p. 17-32. Abegg, F.E., and Handford, C.R., 2001b, Deflation origin of Mississippian carbonate eolianites of southwestern Kansas, in Abegg, F. E., P. M. Harris, and D. B. Loope, eds., Modern and ancient carbonate eolianites: sedimentology, sequence stratigraphy, and diagenesis: Society of Sedimentary Geology SEPM Special Publication No. 71, p. 183-203. Carr, T.R., and Lundgren, C.E., 1994. Use of Gamma Ray Spectral Log to recognize exposure surfaces at the Reservoir Scale: Big Bow Field (St. Louis Limestone), Kansas, in, Dolson, J. C., Hendricks, M. L., Wescott, W. A., eds., Unconformity-related hydrocarbons in sedimentary sequences: Rocky Mountain Assoc. of Geologists, Denver, CO, p. 79-88. Dunham, R.J., 1962, Classification of carbonate rocks according to depositional texture, in, Ham, W. E., ed., Classification of Carbonate Rocks: American Assoc. of Petroleum Geologists, Memoir 1, pp. 108-121. Handford, C.R., 1988, Review of carbonate sand-belt deposition of ooid grainstones and application to Mississippian reservoir, Damme Field, southwestern Kansas: American Assoc. of Petroleum Geologists, Bulletin, v. 72, p. 1184-1199. Handford, C.R., and Francka, B.J., 1991, Mississippian carbonate-siliciclastic eolianites in southwestern Kansas, in Lamando, A. J., Harris, P. M., eds., Mixed Carbonate Siliciclastic Sequence: SEPM Core Workshop 15, p. 205-244. Qi, Lianshuang, and Carr, T. R., in press, Prediction of carbonate lithofacies from digital well logs using neural network, Big Bow and Sand Arroyo Creek fields, southwest Kansas. Qi, Lianshuang, Carr, T. R., and Goldstein, R. H., in prep., Geostatistical 3D modeling of oolite shoal reservoirs, St. Louis Limestone, southwest Kansas.